Some of you may have seen Toyota’s commercial of a Tundra pulling the Space Shuttle across a freeway. Our first reaction when we saw that commercial was, “That’s not real.” To our surprise, the video is 100% real. A Tundra was towing the Space Shuttle Endeavor across a bridge on LA’s 405 Freeway on its way to its new home at the California Science Center, which we visited while we were in LA. The California Science Center is huge. With several galleries spanning more than 400,000 sq. feet, it is a model for science learning by combining exhibits with the on-site Science Center School, and the Amgen Center for Science Learning, as well as a teacher professional development program. Hanging in the entry way to the Science Center is the F-20 Tigershark prototype (donated by Northrop) and the T-38 Talon (on loan from the U.S. Air Force Museum). The Tigershark at the Science Center is the last one in existence. The other two F-20 prototypes crashed during world sales tours. Besides the unique collection of artifacts (spy planes, space capsules, etc) at the Space Center, there are plenty of hands-on activities to learn about the principles of air, space and flight. 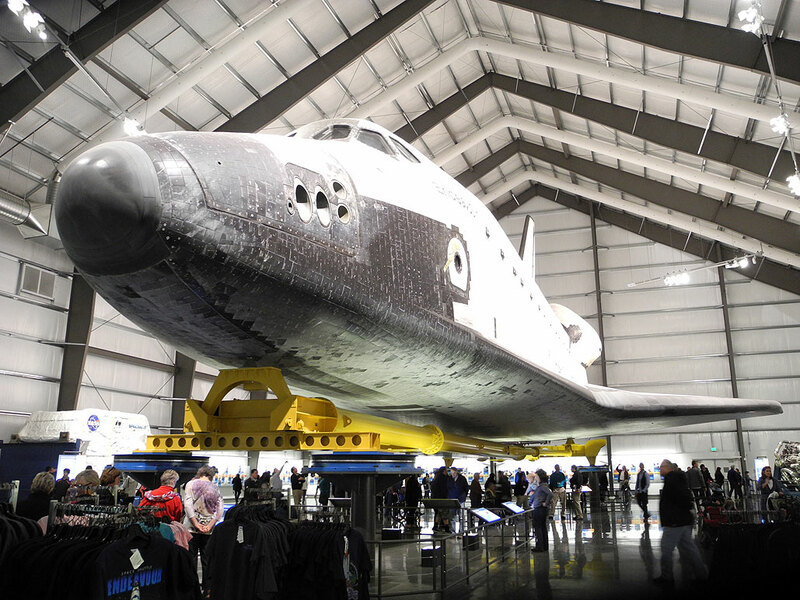 The Endeavor is currently housed in a giant hanger until a more permanent exhibit can be built. The enclosure is spartan, but in no way detracts from the awesomeness of seeing the Space Shuttle up close. In many respects, it made everything feel more authentic, like it may roll out for its next mission at any time. We are big fans of the Endeavour not because of its 25 successful missions into space, but because of its mission to repair the Hubble Space Telescope’s flawed mirrors. The repair took 10 days to make, but it turned the previously blurry HST into the most precise imaging device in the world. When we came face-to-face with the Endeavour, we were struck by how BIG it was. We are not sure why, but we have always imagined it to be smaller. However, is about 122 feet long, has a wingspan of 78 feet, and stands 57 feet off the ground. If seeing the Space Shuttle Endeavour is not amazing enough (trust us, it is), a realspace shuttle main engine is also on view. Built in the US by Rocketdyne, the RS-25 burns cryogenic liquid hydrogen & liquid oxygen propellants. It is not every day that you get to get up close and examine one in detail. On the Space Shuttle, the RS-25 was used in clusters of three engines mounted in the aft structure of the Orbiter, with fuel being drawn from the external tank. The engines were used for propulsion during the shuttle’s ascent, with additional thrust being provided by two solid rocket boosters and the orbiter’s two AJ-10-190 Orbital Maneuvering System engines. Following each flight, the engines were removed from the orbiter, inspected and refurbished before being reused on another mission. 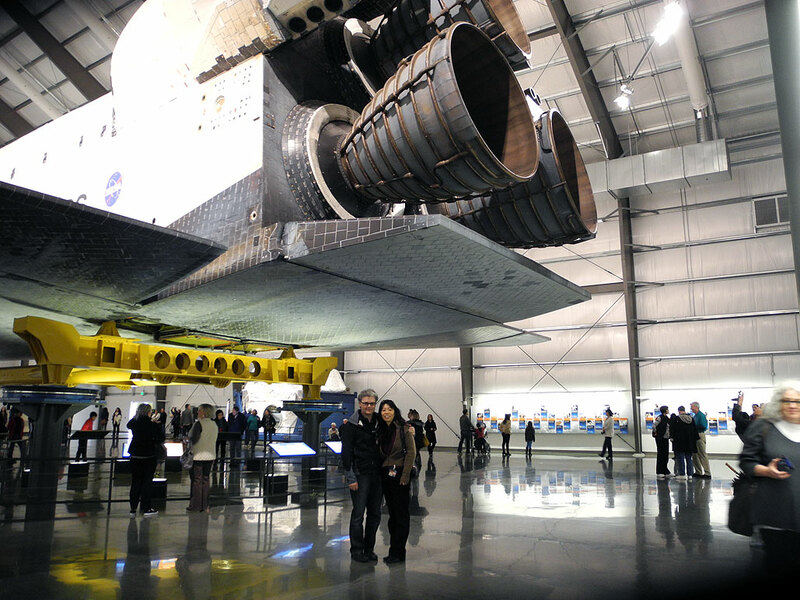 NOTE: The engines attached to the Endeavor on display are replicas…still cool though. 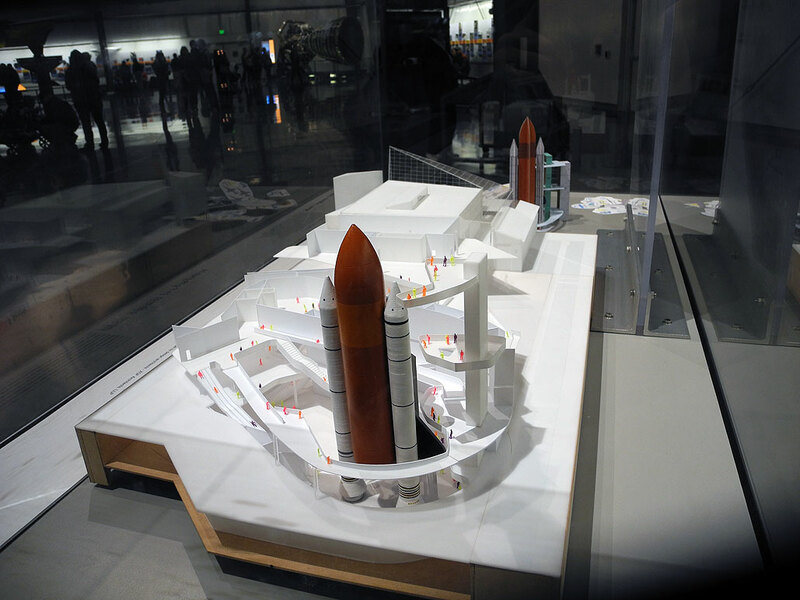 If the $200M fund-raising effort for the Samuel Oschin Air and Space Center is successful, the Endeavor will eventually be showcased in a complex with multi-level views and interior access to the Shuttle. With Endeavour as its centerpiece, the goal of the new complex will be to inspire and encourage visitors to investigate scientific and engineering principles related to atmospheric flight and the exploration of the universe. 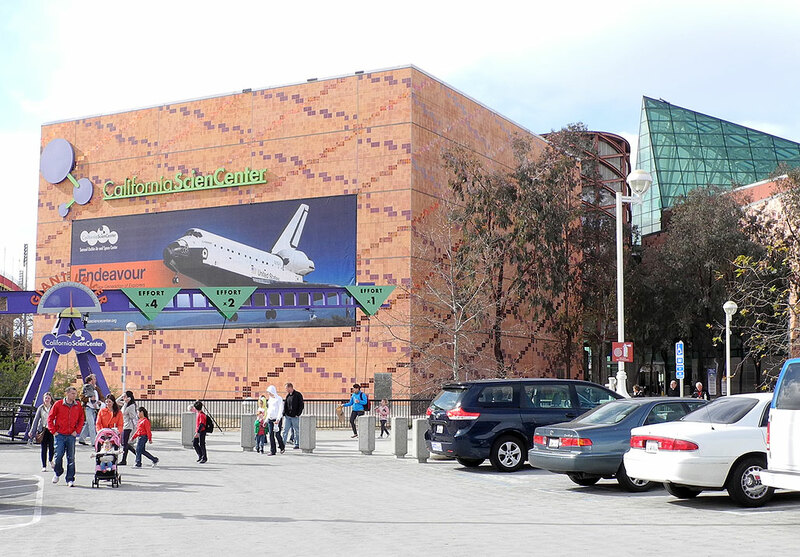 The California Science Center is a great place to visit. It is open daily from 10 a.m. to 5 p.m. except for Thanksgiving, Christmas, and New Year’s Day. All of its general exhibits are free. Special attractions (Ecology Cliff Climb, High Wire Bicycle, Motion-Based Simulator, etc) throughout the complex may have a nominal charge. The best times to visit are on weekends or on weekday afternoons after 1:30 p.m. Weekdays 10 a.m. to 1:30 p.m. are often busy. We had a lot of fun on our visit and we are pretty certain you will too! Did we mentioned that most of it is FREE?